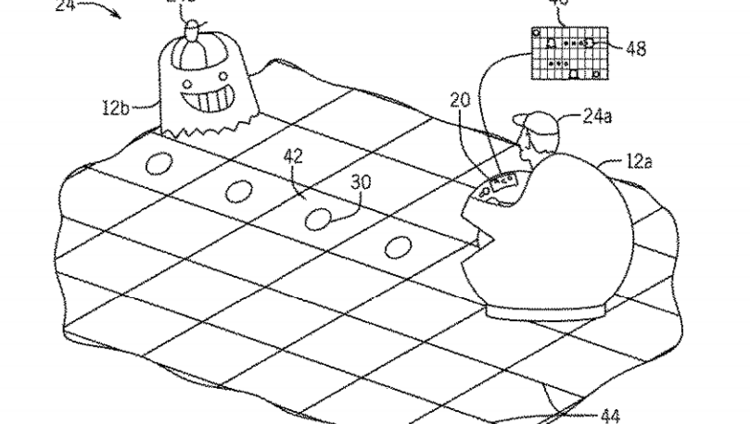 A recently filed Universal patent may hint at the development of a Pac-Man-style ride – a classic take on one extremely popular franchise. The obvious location would of course be Nintendo World at Universal Orlando resort. The theme park’s latest published patent is for an “Interactive Game Floor System and Method,” which looks as if the floor of a ride is a video game screen that interacts with the ride car. The patent appears to try to blend the traditional mechanics of a bumper car system with a bottom screen that can change as the rider drives the vehicle over parts of the screen — like a Pac-Man car that drives over a screen that simulates a giant Pac-Man maze. Ride attractions having vehicles, such as cars or bumper cars, have long been popular. In bumper cars, vehicle riders attempt to “bump” into other vehicles. The vehicles may be powered via a power source in the ceiling and move within an arena. The vehicles may be painted or patterned according to a particular theme, and may be able to accommodate one or more riders. With the increasing sophistication and complexity of modern ride attractions, and the corresponding increase in expectations among theme or amusement park patrons, improved and more creative ride attractions are needed, including ride attractions having more complex vehicle movement and features. The system includes a surface configured to display a plurality of images related to a game. The system also includes a vehicle configured to accommodate a rider and comprising interface circuitry configured to receive an input from the rider related to a vehicle path on the surface … when the vehicle has moved over the first image while on the vehicle path; and update a score associated with the vehicle when the vehicle has moved over the first image while on the vehicle path. 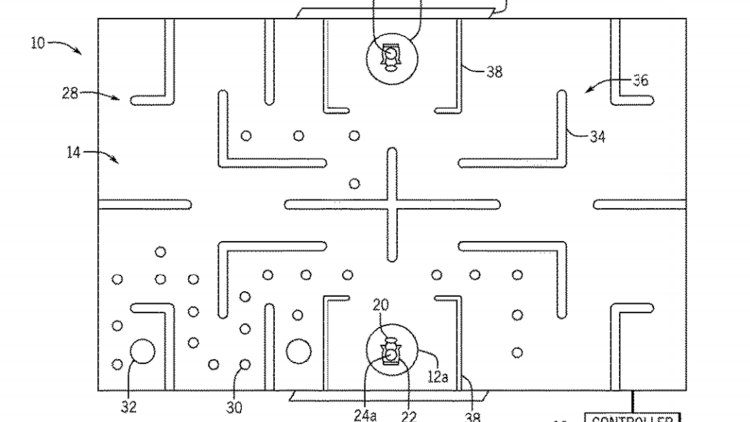 Some of the images included with the patent clearly show how a Pac-Man-style maze could change with the rider’s decisions. For example, certain parts of the maze depicted show the Pac-Man-style car has driven over the traditional dots known in the game as “power pellets” that have been collected by the rider. Of course Universal does not go into detail on how exactly the patent could be used, or if it will specifically be used at the Orlando parks………we shall just have to wait and see!